The 100 season five landed with a “big bang” as the premiere episode, Eden aired. At long last, the hellish hiatus of the beloved post-apocalyptic series is over, but the wait was well worth it. Eden completely blew me away, in all creative and talented facets. It was a rebirth of the series but still incorporated the elements the show is widely known for. Of course, there were some things that I knew were going to happen, but that does not eliminate the fact of greatness. The first half of Eden begins with Clarke (Eliza Taylor) digging herself out of the rubble in the early days following Praimfaya and begins a harrowing trek across a burned-out globe. Her first mission is to head to Polis and try to free the people out of the bunker. Polis is a complete wasteland; it resembles nothing of what it used to be. Along with Praimfaya, everything that the once Grounder capital emulated for went with it. It seemed like Lexa, Roan, and those who entered and politicized never existed, and that is a real blow to the mind. We know that these structured and well-conceived characters left an imprint, and it seemed like a harsh way to dishonor. For a moment, Clarke takes this all in and is nearly shattered. But the emotion is short-lived as she has her heart set on digging out the people-including her mother, out of the bunker. But, as luck would have it, Clarke could not complete the task-despite that she tried her hardest. It’s a very disheartening moment for her, and I can’t help but have complete empathy. She takes a piece of the commander’s throne, a symbol of strength and maybe also to honor the past. Disappointed, she wavers on to her next stop- Arkadia and sees the wreckage of her home. It is not any better than Polis; it’s haunted by the ghosts of those who stayed behind, including Jasper. Her emotions run raw and deep as she goes through the though the treasures of the once carefree boy. Taylor delivers the grief with such purity and such realism that my own tears welled up. I was feeling her pain, her grief, her turmoil, and the loss of a friend. Clarke continues the journey-broken and quickly losing hope. She believes that she has nothing left and she makes her feelings loud and true. Clarke passes out, then snaps when she discovers birds pecking at her. At first, she a bit freaked out but realizes that the birds could be an answer. However, more bad luck occurs when she is led to more desert and obsoleting emptiness. Then, Clarke comprehends the unlikely moment of suicide and considering what she has been through, it may have been possible, and the quick way out. But she is Clarke Griffin, and Clarke Griffin never gives up. And, there is that bird again. The second time Clarke follows the bird (maybe it’s Raven’s spirit) it leads her to paradise, where everything is bright and colorful, and filled with life. Finding Eden refreshes Clarke and renews her. She is happy, exultant, and takes a much-needed bath in the pond. She finds not-so-sweet berries to eat. Yet, not all is ‘heavenly’ in Eden as Clarke discovers that the radiation left no one alive. Her heart breaks once again as she examines the body of a young boy, signifying the horror of the radiation, and then it acclimates to more devastation in the church. As it turns out, Clarke is not alone as she thought she was. She discovers a young, rogue girl who also happens to be a Nightblood, and we all know by now that this girl is Madi. But Madi is a fierce one to be reckoned with. Titling her as the “child from hell” Madi injures Clarke in fear (and done a gruesome stitch job) that she was a Flemkepa scout but dashes off when she finds out that Clarke is also a Nightblood. It’s very understandable because this little girl is probably traumatized and frightened by the events unfolded. Clarke does not disregard young Madi just yet. She notices her spying and draws a portrait in away of love and peace. The offering works. Six years (and seven days) later, Clarke and Madi (now Lola Flanery) have a loving and bonding mother and daughter relationship. And it is the sweetest thing ever. Clarke must be a cool mom if she allows Madi to drive a potentially dangerous vehicle and dyes her hair with berries. How many moms would allow their preteens to drive? One of the more interesting scenes was how Madi has taken a shine to Octavia (Marie Avgeropoulos) and idolizes her. Currently, nobody knows just how broken and angry Octavia truly is after the death of Lincoln. I want to give Octavia the benefit of the doubt as she is in deep grief and trauma, but I also fear that Madi will be hurt or terrified when she finally meets Octavia. I don’t think Octavia is as compassionate with children as Bellamy is. But, who knows until we get to that bridge? And, that will be a shaky bridge to cross. Upon the Ark, Space Kru is living off Triple-G (Green’s Green Goop) and finding a way to get back to the earth. Raven (Lindsey Morgan) is working her brains off trying to solve the problem of landing, and Bellamy (Boby Morley) (whom by the way, is swoon-worthy) is distraught about it. His main priority of getting to the ground is his sister, but Bellamy is not going to be impulsive and try to crash-land the Ring. He might have done so in the past, but this is a new Bellamy and quite the interesting one. Murphy (Richard Harmon), poor crazy Murphy. What happened to you man? We all seen the fight between Bellamy and Murphy in the trailer, and tonight we found out why. Murphy has disbanded from the group, preferring to live by his own rules, and just being an outsider. The fight boils down to Bellamy “invading” Murphy’s side of the ship, but Bellamy tells him that he is not worthless. Oh, and Memori is no longer a thing and that breaks my heart because they were such an adorable couple and one for a positive disability relationship. We do not have very many of those on the tv spectrum, and it was enlightening to have one that was created so wonderfully, and that disabled characters are not typecasted as the “feel sorrys” or the “tag-alongs.” But, things happen, unfortunately, and we will find out later about what happened to Murphy, as well as the breakup. I am guessing that the breakup was a rather difficult one, given that the behavior and body language, not to mention the language, that was spewed between them. It turns out that Murphy is not so “worthless” after all. He discovers a ship hovering over that precious patch of green, and the others are just as astonished as he is. However, kru is not ready to fully engage with the pod which is being launched to earth, and with great measure and reasoning. Raven tries to make contact, but so far, it’s in vain. Meanwhile, Clarke rushes Madi over to her hiding place after the prisoner pod lands. For Clarke, she is now in full “mother mode” and it is a great fit for her. This side of Clarke is really intriguing and will develop even more as the season rolls on. The introduction of Charmaine Diyoza (Ivana Milicevic), the leader of Eligius, and the prisoners was like a fanfare. As simplistic as stepping out of the pod may seem, it really brought the focus in on the new “baddies.” Charmaine seems to be feared of, and Paxton “Graveyard” McCreary (William Miller) who is the notorious mass murderer is wanting to be her second-in-command. With this perspective, perhaps McCreary has not done the murders on his own-as I don’t want to scare anyone with the psyche of killers-but usually those who commit murders as one often stay secretive. Otherwise, he would not be asking for Charmaine’s approval. So, did McCreary actually commit the killings himself? Or did he have a partner in crime? The thought of this alone is starting to become dark, so I am going to move on. Zeke Shaw (Jordan Bolger) is the softest prisoner so far in the group, and despite his few minutes in Eden, I am already captivated and excited about his character. What will he bring to the series, and how did he become a part of Prison Kru? Zeke is one of the nonviolent offenders, but to be imprisoned with serial killers and rapists, he must have done something that is a federal offense. Maybe he hacked into the CIA or the FBI files or embezzled government funding. These scenarios seem viable as we know that Zeke is an explorer and most likely great with technology. Or perhaps that he IS a violent guy, and it was not revealed just yet. Either way, this Zeke guy is one to watch out for. In a good way. 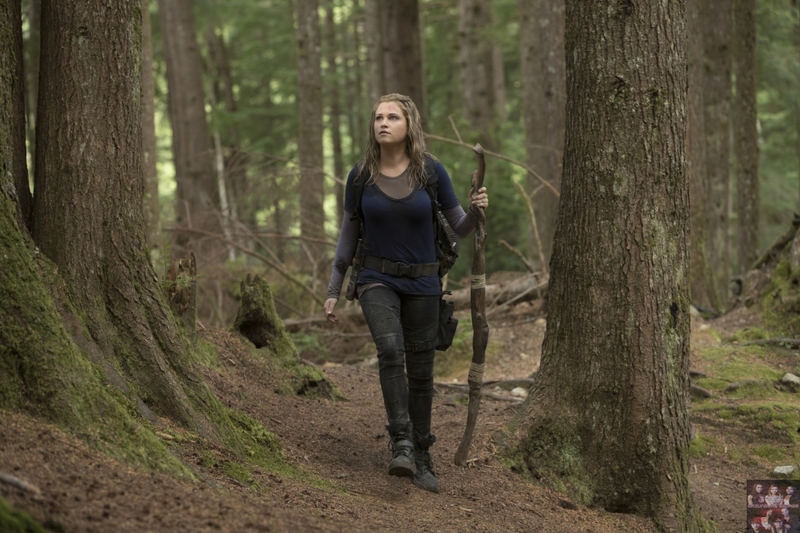 Madi is soon found by two prisoners, but Clarke is not going to have it. She kills the guards in protection, even though Madi tells her that one was a “good guy.” I believe with this action, Clarke may have indirectly may have caused more issues. On the other side of the coin, you do not get between a mother and her child otherwise you are screwed. That is when Charmaine and the others who are ransacking the town realize that they’re not alone. They are definitely not, and they don’t know who they’re dealing with. I have to be completely honest, but I knew that Bellamy and Echo (Tasya Teles) would eventually get together since season two. As harsh and vindictive as that may sound. This relationship came to me as no surprise, nor did it shocked. These two characters have a distinct aura, an invisible chemistry that no one else possesses. Echo was more of a follower than a leader, and she was brainwashed by her Queen, and because of that all her actions had to meet her evil Queen’s approval, and the consequences, if Echo did not do the orders, would have been cruel and inhumane. As for King Roan, Echo pretty much done the same thing, simply following his commands, and trying to be the perfect servant. Am I condoning her combats? No, but every single person on this show, living or dead, has committed a crime. Those crimes were committed for the survivability of their people, and for the safety of their loved ones. With Bellamy (something must have happened offscreen in the six years between them), Echo sees herself as a better individual, gentler, and certainly more open. I believe that Bellemy was the first person to offer her kindness, despite her tough demeanor, and she allowed herself to feel that. On The 100, forgiveness, change, and redemption are two major character arcs-and Echo is trying to redeem herself through Bellamy. She knows that she has done terrible things and she is not going to deny that. I have seen the pain and shock when she nearly killed Octavia-that she really didn’t want to do it. How Bellamy forgave her for that, I don’t know, but it must have taken a lot to do it. However, after he let go of the frustrations and the distrust with Echo, he allowed himself to move on and found her in a new light. The other aspect that I want to point out that life is filled with all kinds of relationships, and The 100, unlike most other shows on the medium, reflect these relationships. If The 100 has taught us anything, in both contextual and the overall realm, is that the show is not primarily based on romanticism. It does, however, created an exemplary field of how others coöperate and try to find a solution in the direst situations. But the real obstacle will be Octavia, and yes, Echo is still banished. Yet, Bellamy believes that his sister will find a way to forgive Echo, and nothing will change. But knowing just how ‘dangerous and angry’ Octavia will be this season, she will not find an easy way to forgive Echo-if she does at all. Unlike Space kru and Clarke, Octavia has felt the impact of that six-year time jump, nor has she witnessed the stark changes people went through. But, if she had not experienced the time jump, then how did Octavia grow as a person? What did she learn by being the Commander-or did she simply decided to keep her anger in full rage, not letting go of things, and allow herself to close off? I have no doubt in my mind that there will be issues about Becho and things will get ugly between the three because of it. Yet, if Bellamy says that Octavia will understand, then I must go by that. After all, he knows his sister better than anyone-or, so he thinks he does for now. Eden has to be one of the strongest The 100 episodes to date, and the reason for that is because of the evolving form of the characters and how they industrialized over that time jump. Another is the gloriously created new bad guys, and the show is known for having multi-dimensional villains. Like all the others though, each has the same mindset: to survive, no matter the outcome, or how it’s done. There is no moral compass and to watch each version of how one tries to survive is fascinating. The mother/daughter bond of Clarke and Madi is a wondrous narrative all its own, and I am enthusiastic to see Madi’s development and dynamics with the other characters. As for Clarke, she seems happier than she has ever been, but she will put up quite the battle for the protection and well-being of her adopted daughter. For Monty and Harper, things are continuously going well for them. Harper will be the key to healing and helping her love, and that is true companionship. Overall, The 100 has launched really well for the fifth season premiere and may it continue its journey! I loved how Clarke provided the narration and experience during her time. This created a profound and in-depth look at the aftermath of Praimfaya and how it affected her. Why hasn’t young Madi washed up when there is water around? For Bellarke fans, I know that you are hurting, but the time will come. And you’ll be alright! Charmaine scares the hell out of me, but I want more of her too. Octavia definitely needs some therapy sessions. Echo, Emori, and Raven are all bffs, and I love it. Girl power is the best power! So, why did Emori and Murphy break up? There are several parallels that are connective to the past four seasons. Can you spot them all? That time jump has done wonders. This often fails in most shows, but it was magic this time. Murven (Murphy and Raven) are always a treat to watch, and I loved their interaction once again. Those are some very powerful and destructive looking weapons the prisoners brought out. I am intrigued by that giant pen looking thing though. I believe that Clarke is too. Lola Flanery is darling and a joy to watch. Come back next week for my review of the Red Queen. Hopefully, it won’t be gruesome, but I am not making any promises. Did you enjoy Eden? Let us know in the comments section!